If you were following along this past week when I did my try on haul on Snapchat and Instagram, you might have already seen this look! But I wanted to show you guys step by step how I got this natural makeup look and all the products I used to get here! Listing out the step by step list below OR you can watch the full tutorial in my video HERE or at the bottom of this post! If you see a ** next to the product, it means it's currently part of the Nordstrom Sale! They have some amazing beauty products on sale right now that I picked up but also a ton more that I want to try. Be sure to shop it all HERE! Tula Face Wash / **Clarisonic: Always have to wash and prep your face before applying makeup and like mentioned in my skincare post HERE, I only use the Tula face wash for my cleanser. It's the very best stuff for your skin and won't break you out!! **StriVectin Neck Cream: So excited to have snagged this during the sale. I had a tester/sample size not too long ago and I loved what it did for my neck. **Charlotte Tilbury Magic Cream (Full set on sale HERE): Charlotte Tilbury has some of the best makeup skincare around and the magic cream is a game changer. It totally hydrates my face and makes it extra durable for when I'm applying makeup. **NeuLash Duo (also on sale is the NeuBrow set): You guys always compliment my lashes and while I haven't been as diligent about putting it on as of late, I'd like to think this is helping the cause! You can see my full review of it HERE but it really does work! Charlotte Tilbury Wonder Glow: This is obviously a little sample in the video but I love using this as a prime/prep before my makeup to give me that extra boost of glow! Clinique Foundation: This is my favorite foundation as of late to really give you a nice medium coverage but still looking completely natural! I think the key is to have a natural base and this is it! **Beauty Blender Set: I can't do my makeup with out it! This set is actually perfect because you get a little carrying case (so they don't get dirty in your makeup bag) and a soap to clean them after you use them! Nars Concealer (in light vanilla): I'm testing this one out but I really love how much coverage it gives and how easy it is to blend out! I think I get what all the rave is about! Charlotte Tilbury Mini Miracle Eye Wand: This is my holy grail product!! I use it wether I'm doing a full face or just wearing mascara -- this is the perfect little wand to really highlight and boost your face. Laura Mercier Under Eye Powder: Can't live without this under my eyes. It may not look like much but it really does help brighten your under eye and it won't look cakey. Charlotte Tilbury Powder: This is the best powder out on the market right now. It's so finely milled you can apply 10 layers and it will still look like your skin. 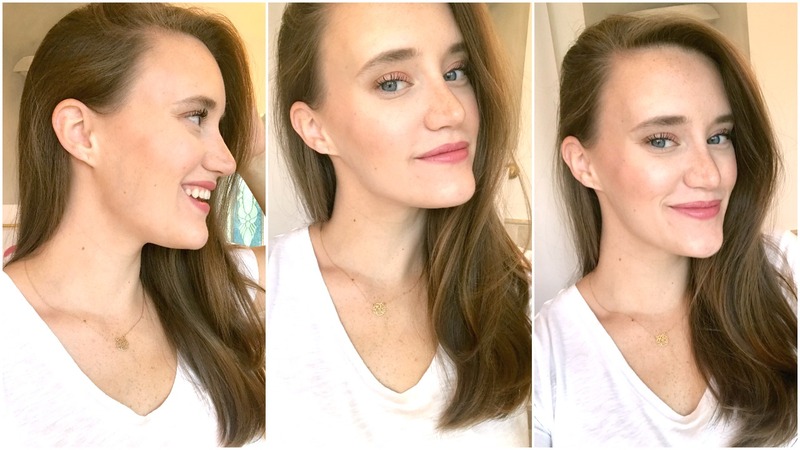 Total game changer for the natural makeup look I like to go for! **Sigma Brushes Set: Sigma brushes are some of my favorites to use -- they really stand the test of time and are worth the money! **Hourglass Blush (full set HERE): Been using this blush for forever -- works like a charm every time. Nars Highlighter (color albatross): This was my first ever highlighter and I just recently rediscovered it in my makeup bag. It's going to always be the best highlighter -- but I would only recommend it for lighter skin seeing as it's a stark white highlight. Anastasia Beverly Hills Brow Wiz (medium brown) / Benefit Gimme Brow: The magic duo that create my eyebrows! I have little to none up there so these really put in all the effort! **Anastasia Beverly Hills Clear Brow Gel: You don't *need* to use this but I like to when I'm doing a full face and going to be outside for most of the day shooting. It will really keep product from falling onto your eyelids. Dior Lash Primer / YSL The Shock Mascara: The fantastic duo! I couldn't live without them and these are what take my eyelashes from nothing to something. This YSL mascara is the best I've ever tried and highly recommend it!